The graph below visualises the hyperlink network of twenty-one political platforms in the EU context for the period between March 2011 and March 2013, which can be seen as one of the most tumultuous phases of the so-called EU crisis. The sample includes four major news media websites, three government websites (UK, Germany, Greece), four official EU websites, two think tank websites, four bloggers, and four NGO websites. I extracted all links from a sample of ca. 1320 postings that were published on these websites within the 24 months of intense crisis discourse covered in the analysis. Each node represents a website, while each line or “edge” stands for a unilateral hyperlink connection coming from a source (one of the 21 websites of the sample) to target; the size of a node implies how much content was produced by the respective platform within the focused time span, while the thickness or “weight” of each line indicates how often a website was linked to from a source. EU online media web sphere based on hyperlinks. The graph created with Gephi. For starters, one can easily see that each of the sampled platforms had its very own sub-network of connections and references; they appear as centres of separate yet not completely isolated clusters. Could this be tendencies towards “silo formation” and fragmentation in the EU web discourse? At least the hyperlink pattern in the sample implies such a development, though the same must not necessarily apply to the actual content level and the network of non-hyperlink in-text references that might have emerged there. Still, looking at the structure of hyperlink networks provides access to the fabric of the transnational debate on the EU crisis and forms an adequate starting point for a more detailed discussion. Apart from the smaller clusters around each node there seem to be ties between politically-ideologically similar websites; for example, in the upper half official EU web presence form a interconnected sub-network; on the right Eurosceptic websites appear to “amass”; the pro-European/federalist NGO Europa Union Deutschland mainly linked to a selection of like-minded sources, too. However, there are a few outliers that need closer examination, such as the “detached” sub-cluster around the extremely anti-European website Team Europe. It is also interesting to observe that most websites link to themselves, as indicated by the coloured circles attached to the central nodes. Again, the bigger or “thicker” it is, the more often a particulate website tended to place a hyperlink to its own content within its postings. These are just a few preliminary reflections and the initial observations need a more detailed discussion against the background of web-/public sphere theory and transnational communication. 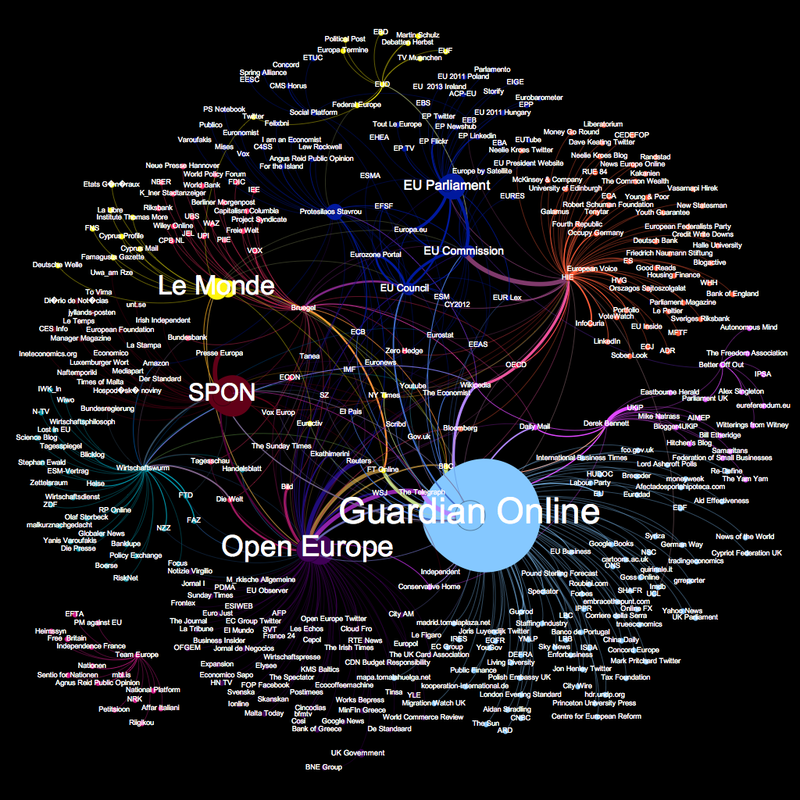 Nevertheless, this network graph highlights some interesting implications and provides further proof that at least a rudimentary transnational web sphere emerged in the EU crisis context.